A few people can be seen on the covered walkway over W. Fulton St., which connects the two parts of the Phoenix factory. 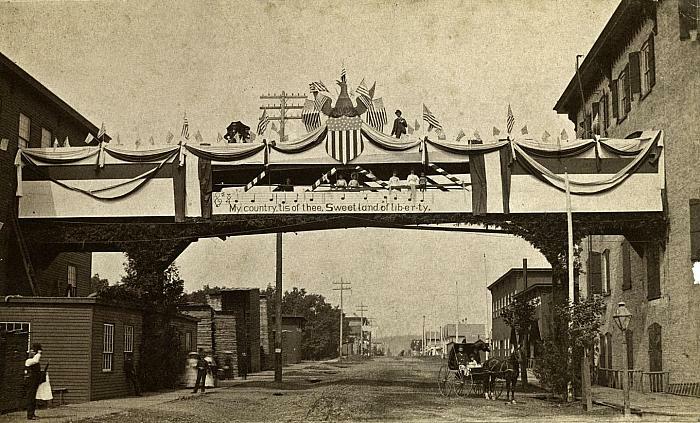 The decorations and flags adorning the span are in honor of the 1876 Centennial Celebration. At the lower center are musical notes and the first line, "My Country 'tis of Thee, Sweet Land of Liberty," of the popular patriotic song. The view looks toward the west. The Phoenix Furniture Co. was located on West Fulton at Summer Ave.
Coll. 54-41-3, History & Special Collections Dept.